Born in Bordeaux in 1875, Marquet moved with his family to Paris in 1890, in order to study drawing at the École Nationale Supérieure des Arts Décoratifs. He befriended Henri Matisse, and both men studied under Gustave Moreau at the École des Beaux-Arts from 1894 to 1898. In 1900 they were hired to paint the Art Nouveau ornaments of the Grand Palais for the Exposition Universelle. 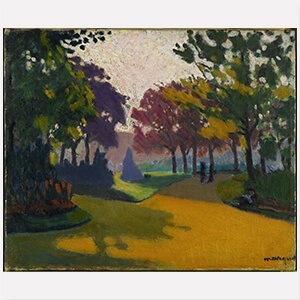 A year later, Marquet showed his work at the Salon des Indépendants, and in 1905 participated at the Salon d’Automne, which marked the emergence of Fauvism. Like his fellow Fauvist painters, Marquet preferred painting landscape motifs, often ports and rivers in richly saturated hues, using spontaneous brushwork. 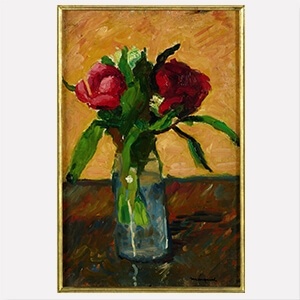 Compared to Matisse, Vlaminck and Derain, however, Marquet`s palette remained quieter and more subdued.